Bring out an Italian side of Dad with the Dolce & Gabbana Light Blue Italian Zest! The fragrance is a pure explosion of fresh bergamot and brightens with top notes of grapefruit and mandarin, while pepper and juniper add a spicy tang to the rosemary and rosewood heart notes. Light Blue Italian Zest is an invitation to make Dad's summer sparkle with a zest! Surprise Dad with a refreshing yet elegant scent with Mr. Burberry. The new fragrance captures zesty and herbal top notes of lemon oil, blackcurrant and rosemary layered over green violet leaf, driftwood and spearmint – with a warm and earthy base of amber, white oak moss and musk. It's surely a fragrance Dad will love! Let Dad adventure into the blue with the fresh and woody fragrance of Tommy Bahama Deep Blue! Opening with an exhilarating blend of citrusy bergamot, spicy cardamom and aromatic juniper, this cologne transitions to a wave of fresh florals, which matures to warm and earthy musk, cedarwood and patchouli. The fragrance will take Dad on a journey he will never forget! Surprise Dad with a fragrance that is both bold and trendy with Gucci Guilty. The scent awakens the senses with top notes of lemon, lavender and pink pepper. This is a truly a luxurious fragrance that a modern Dad will appreciate for Father's Day! BOSS Bottled United is a Limited Edition scent perfect for Dad! The fragrance combines the freshness of the outdoors with the urban warmth of woody notes. Wild buchu plant notes open an invigorating game and are energised by crisp spearmint, while warm woody notes round up the scent to provide sensuality and strength. Dad will love this masculine fragrance which makes a perfect gift for Father's Day! Surprise Dad with a HOT scent from Salvatore Ferragamo! Salvatore Ferragamo Uomo Casual Life Eau de Toilette is a charismatic and vibrant representation of masculinity, where fresh green notes interact with powerful woody and invigorating accords of intense dynamism. 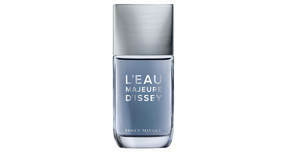 The Issey Miyake L'Eau Majeure d'Issey ​is the perfect gift for Dad that takes its inspiration from water. The fragrance opens with notes of bergamot blended with fresh grapefruit and crisp salty sea wind. The base features woody accords softened with velvet cashmere notes.​​ Dad will surely love this refreshing scent! Keep Dad refreshed and smelling fabulous with the Pure Romance Titan Scented Deodorizing Spray! This all-over deodorizing body spray fuses notes of spicy bergamot, rich amber, and fine leather. Featuring distinctive ingredients rich in antioxidants and Vitamin E, Titan Spray is essential for the Dad on the go! Let Dad mix up a scent he will love with the Kenneth Cole Men's 4-Piece Gift Set! The set features Kenneth Cole for Him Eau de Toilette Spray along with three vibrant fragrances that Dad can layer on to create his unique personal scent! The three sprays included are Serenity, Energy and Intensity!